Mustard oil, with its strong pungent smell is mostly used for cooking purpose in some parts of India. However, are you aware that it can also be a great handy solution to keep your hair strong, healthy and shiny at its best? Used since ancient days, mustard oil is widely known for its medicinal properties and often used as substitute for regular hair oil. Some of the most prominent problems that majority of people suffer include split ends, rough hair and hair fall. It has been observed that exposure to dust and dirt, stressful lifestyle, improper diet etc. are significantly associated with hair problems. To get rid of these problems that may appear negligible but can play mental havoc, mustard oil is the easiest and proven solution to try out. Loaded with multiple qualities, mustard oil is one such ingredient that is available in every household. Instead of running to salons for hair care treatments, check out this magic product to get silky soft tresses within few days. Antioxidant and Vitamin for Strong Hair: Mustard oil has antioxidant, minerals and several useful vitamins such as vitamin A, D, E which are essentially important in hair growth process. Use mustard oil regularly to add good quality calcium, iron and zinc to the hair, thus enhancing the strength of hair from the roots. Stimulates Hair Growth: Our scalp gets affected from the daily pollution, thereby losing its nutrition and needful vitamins. With a massage of mustard oil, you can easily rejuvenate your tresses instantly. Use lukewarm mustard oil on your scalp so that the hair roots get strong and stimulated. A massage also enhances the blood circulation of the scalp which helps in reproducing hair follicles. Food for Good Hair: Proper nourishment is very important for good hair and its maintenance. Most people don’t get to eat proper diet to high stressed lifestyle. 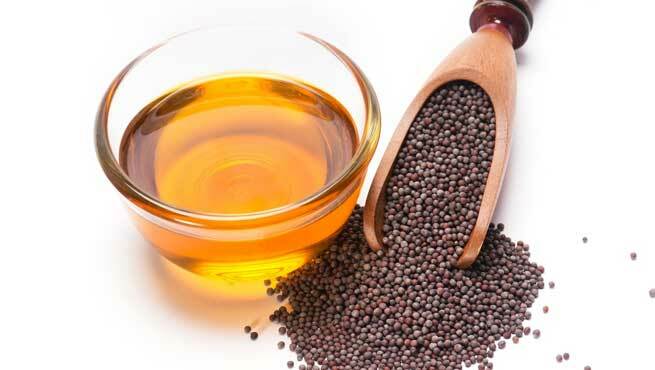 Mustard oil is the solution to bank on as it provides multiple nutrition to your hair in a comprehensive manner. A Natural Conditioner for Your Tresses: Mustard oil contains high quality of alpha fatty acids which is a natural component to nourish and condition hair without any side effect. It also keeps your hair hydrated, making it grow strong and thick. 1. Quick Oiling before Shampoo – If your hair turns very brittle just after shampooing, then you can use about a tsp of mustard oil and massage your scalp for five minutes before shampooing. This will ensure that your hair does not become excessively dry. 2. Soak for a couple of hours before Shampoo– Take some warm mustard oil and massage your hair thoroughly with it. Once you are done coating your roots and the hair with the oil, take a towel, soak it in warm water, and wrap it around your hair. Leave for about half an hour. This will ensure that the roots open up and the oil nourishment reaches deep into the roots. 3. Overnight Oiling – Mustard oil generates a lot of heat when you massage it, making it an excellent pain reliever. So if you have a tendency to catch a cold, then mustard oil is a safe choice for you. You could heat a bit of the oil and massage it well into your hair. Cover with a shower cap or put a towel on your pillow to prevent staining from the oil. Leave it overnight and shampoo it the following morning. Your hair will become strong and shiny with repeated use. Traditionally Mustard oil has been used to fight hair loss, scalp related problems and reverse grey hair. It also promotes hair growth by increasing blood flow and circulation to the scalp. Mustard oil with yogurt: Make a smooth paste with one teaspoon mustard oil, two tablespoon yogurt and an egg. Apply this mixture thoroughly on the hair; let it dry for 30 minutes. Now wash it off well with a mild shampoo. Try this mask for twice a week to get best results. Black tea and mustard oil: Another effective hair mask to bank on is the blend of black tea and mustard oil that works wonder in treating dandruff. Mix together one teaspoon honey, one teaspoon almond oil, rosemary, mustard oil and an egg. Massage your scalp well with this mask and leave it for at least half an hour. Now wash off properly with a shampoo that suits your hair to get clean and dandruff free locks. Mustard oil and coconut oil: If you have extreme brittle and dry hair, sometimes it is better to indulge in this hair mask that combines the goodness of both coconut as well as mustard oil. Take equal quantity of both the oils in a bowl. Mix together and apply on the scalp and hair roots. Rinse off with a shampoo wash after half an hour. You can also try using mustard oil with other simple ingredients such as olive oil, mayonnaise, butter and much more. Be the head turner; flaunt your silky soft hair that is strong and beautiful from within. How long should I keep mustard oil on my hair? Depending on your hair, this will vary. If you are suffering from dry and brittle hair, apply it for 2-3 hours before washing it off with a gentle shampoo. Typically 30-45 minutes of application should be good enough. 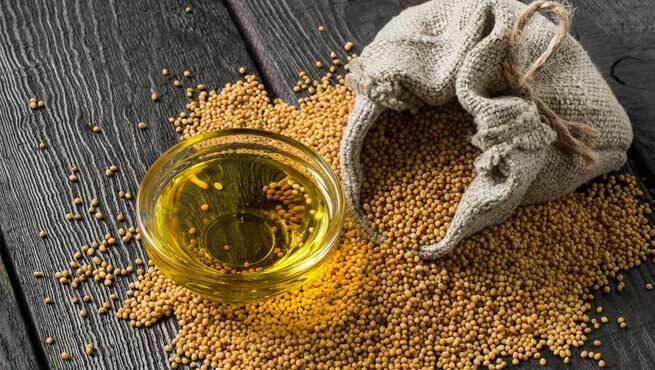 Why mustard oil is banned in US? Is there any side effect associated with Mustard oil? Although in many countries, edible consumption of mustard oil is prohibited because of high content of erucic acid, mustard oil is used as a most preferred edible oil in India and Bangladesh and no adverse effect has been reported till now.